It’s time to celebrate the hardworking, strong, and loving women in our lives. Mother’s Day is the third largest retail holiday in the US with total spending around $26.3 billion—the highest it’s ever been! This year Mother’s Day falls on May 13th so you’ve still got plenty of time to prepare. Keep in mind many countries apart from the US celebrate Mother’s Day on May 13th including Australia, Belgium, Brazil, Canada, Croatia, Cyprus, Czech Republic, Denmark, Estonia,Finland, Germany, Greece, Greenland, Iceland, India, Italy, Malta, New Zealand, Netherlands, Switzerland, and Turkey to name just a few! Make sure to launch EU campaigns for global buyers too. Our team is looking to share great Mother’s Day gift ideas with buyers so add the hashtag #MothersDay2018 to your best mom-themed designs! Mother figures of all kinds should be celebrated on Mother’s Day (and every day)—this includes mothers-in-law, stepmoms, new moms, LGBT moms, and more. Don’t forget Grandmothers! More than 13 million kids in the US are living in homes with their grandparents (Brandon Gaille 2017). An inclusive approach to selling can expand your buyer audience and allow you to create a variety of products everyone will love. Try testing variations of your designs with nicknames like ‘mom’, ‘mommy’, ‘mama’, etc. or ‘grandma’ ‘nan’, ‘nana’, ‘nanna’, ‘grandmother’. Many people have a special name for their loved ones so adding this personalization can encourage them to connect with your design message. What’s trending this Mother’s Day? According to research by Media iQ (2017) shoppers searching for Mother’s Day gifts online are nearly 4x more likely to prefer vintage and retro items as gifts. For example, combining a ‘working mom’ design theme with a vintage flair could create something moms would be proud to wear. Check out our mood board below for a snapshot of popular design aesthetics and color palettes. Don’t forget you can appeal to the modern mom with a sassy slogan too. Not all moms want flowers—some would prefer a good laugh instead! 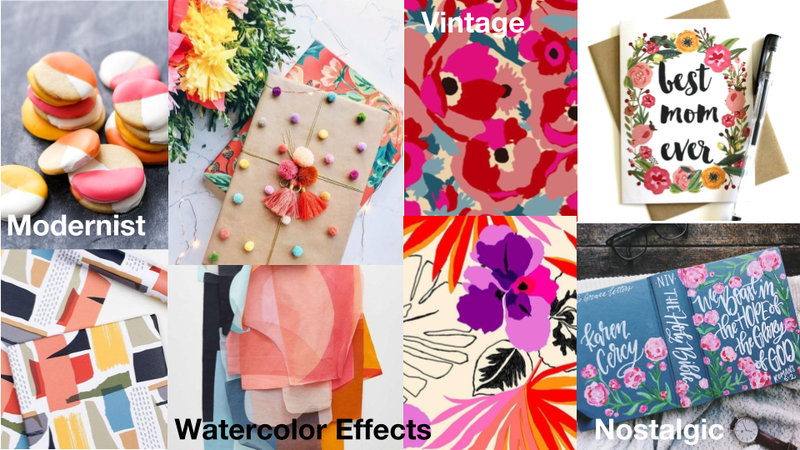 Our trend insight shows that floral patterns are predicted to be top-sellers for Mother’s Day—so consider creating vintage/floral designs as you choose products to add to your collection. Activewear has officially outpaced denim sales in the US and moms are no exception to this statistic! 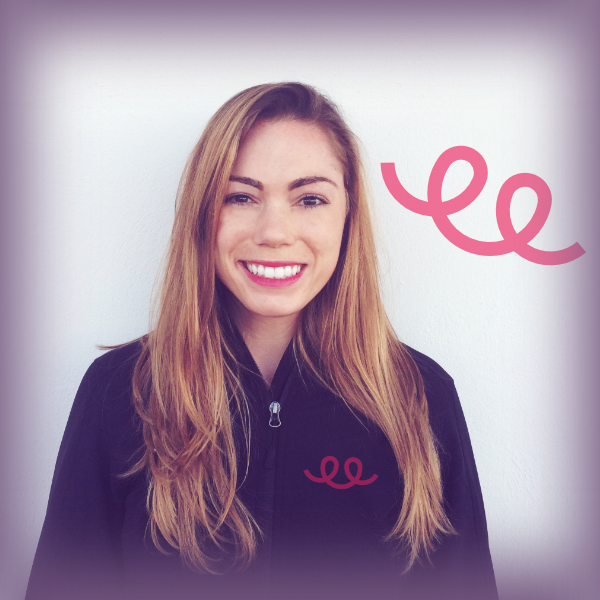 Take advantage of the new Teespring leggings and create comfy, quality items for shoppers to admire. Also, technology isn’t just for the kids. Tech-savvy moms are everywhere and with 75% of mothers working full time in the US, moms have to multitask on the go. Teespring iPhone cases can make a great personalized gift. Below are the cutoff dates for Mother’s Day delivery. Once we’ve passed the standard shipping cutoff dates, buyers can still receive their products in time for Mother’s Day if they select rush shipping at checkout. 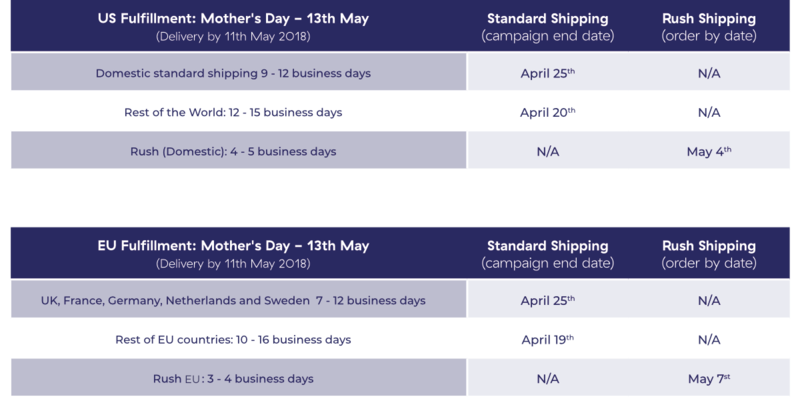 Plan to manually end your campaigns on the standard shipping cutoff date to ensure shoppers get their order by May 11th (and you can immediately relaunch it). For rush shipping, the buyer just needs to place their order by the “order by date” listed below (don’t forget to add rush eligible products to your listings). Don’t forget we’re looking to share great Mother’s Day gift ideas with buyers. Add the hashtag #MothersDay2018 to the description of your best mom-themed designs to be considered! When will you guys be browsing through the list of people participating? Hey John – we are currently searching for content. We’ll ramp up buyer marketing as we approach the cutoff dates too. when is the right time to start advertising a product about this mother’s day? Please I need help in understanding the standard shipping cutoff date and the last section of the article. You can learn more about cutoff dates here. Please I need help in understanding the standard shipping cutoff date.